What is this thing? What can it tell us about the people and places of the past? As part of my postgraduate studies at the University of Glasgow, I have been working as a work placement student with Brandanii Archaeology and Heritage. Much of this work has been concentrating on material from archaeological excavations carried out here on the Isle of Bute. Sorting through hundreds of fragments, once in a while an object stands out from the others, remarkable perhaps for its difference or its familiarity. I have chosen a small handful of these objects to look at more closely, each from a different time and place on the island. Heading back from the 20th century to the Neolithic, with a few diversions on the way, this story takes a look into the Isle of Bute's recent and distant past. The ceramic insulator is 120mm in length and 74 mm across at the shoulder. The exposed stem is 42mm in diameter with a 28mm diameter hole along its length. 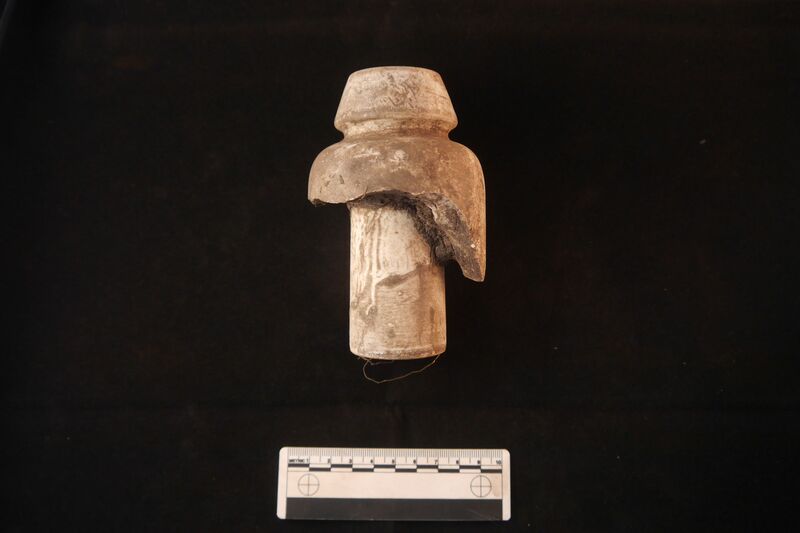 The first artefact is a ceramic insulator found during an excavation in 2011 at the monument site known as Cnoc an Rath. The artefact dates from the late 19th to early 20th century. The insulator is made from porcelain mixed with stoneware and has a white lustre. There are traces of slip on the surface and the insulator is smooth and cool to the touch. The outer surface that usually bears the makers stamp has broken away, it is not possible to say where the insulator was made. The artefact closely resembles the British ‘Cordeaux’ insulator U-1450. This type of insulator was manufactured for over a century practically unchanged. The insulator provides evidence of the development of the island’s electrical infrastructure and its historical tramway. Welcome to the Porcelain Insulator Collector's World. 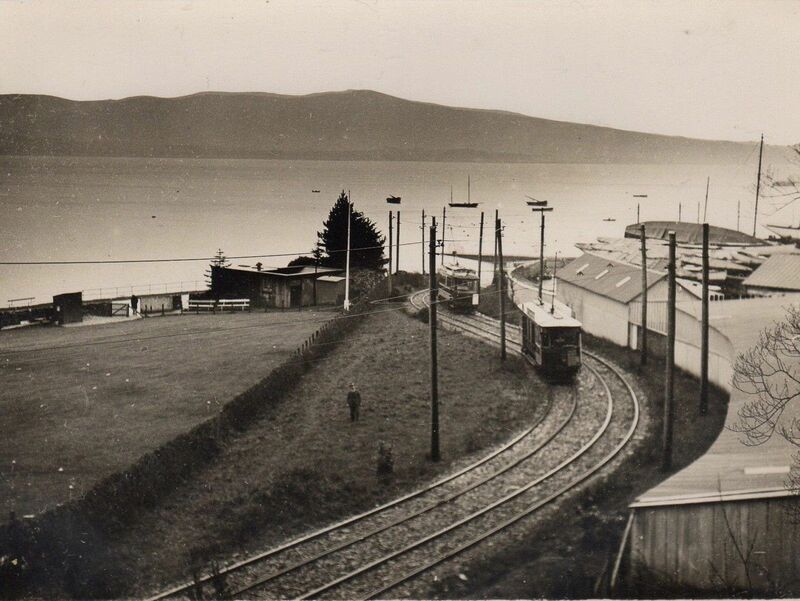 Rothesay Tramway on the Isle of Bute, this is the end of the line at Ettrick Bay. The Rothesay Tramway began life in 1882 as a horse-worked line, carrying passengers from Guildford Square, Rothesay to Port Bannatyne. It was rebuilt and electrified in 1902, and extended to Ettrick Bay. One of the station stops was at Cnoc an Rath where a low masonry platform remains to the south of the monument. Traffic peaked in 1920, but as bus services developed the tramway fell into decline and closed in 1936. The insulator would have been installed during the 1902 rebuild, or later. Nothing remains of the original tramway although a recreational footpath follows the historic track from Port Bannatyne to Ettrick Bay. The old tramway depot at Port Bannatyne now serves as the island’s bus yard. As well as providing evidence of the tramway the insulator offers an insight into the status of the Cnoc an Rath monument between 1902 and 1936. The site was deemed important enough to warrant a dedicated tram stop where people would spend time to visit the mid-C19th `Lone Man's Grave', tomb of James Hamilton of Kames. A short film about the site at Cnoc an Rath. Clay pipe stems from St Blane's church on the southern end of Bute. 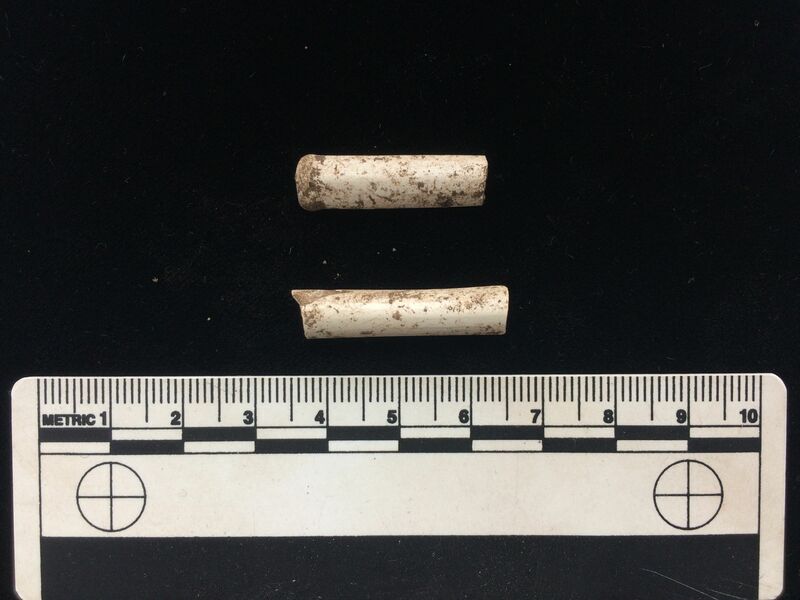 Fragments of clay pipes are regular finds on archaeological sites throughout Britain. 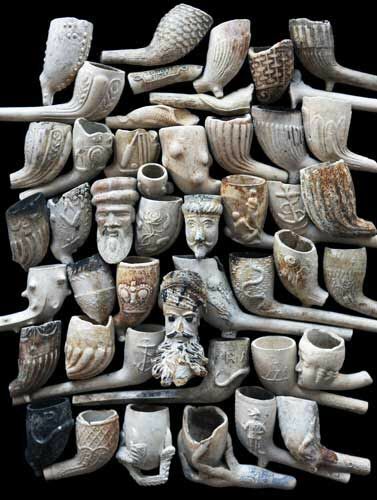 Clay pipes were fragile and easily broken, many were discarded onto middens and later spread onto agricultural fields. The two pipe stems were found during the reinvestigation of the 19th century works carried out by out R W Schultz in 1895-6 for the 3rd Marquis of Bute. The longest pipe stem is approximately 30mm long, the second is shorter at around 25mm with a rounded end, it is probably a section of a mouthpiece. The pipe stems are smooth and made from porcelain. Found in what is thought to be the spoil heap from Schulz's excavation, could these pipe stems have been discarded by labourers working on the site? The first known image of a man smoking a pipe, from Chute's Tabaco (1595). Sir Walter Raleigh is commonly believed to have introduced tobacco into Britain in 1586. However, Spanish and Portuguese sailors had been smoking tobacco for many years before. It is likely that the habit of pipe smoking had been adopted by British sailors before 1586 and as early as 1565. Clay pipes were made in two part moulds and could be very ornate. The practice of smoking tobacco in Britain began in the 16th century but is not recorded in Scotland until the 17th Century. The first pipe maker and tobacco supplier in Scotland was William Banks of Edinburgh in 1662. Clay pipes were made in moulds and would have been affordable to most people; they were used by men and women. The Inverness Burgh accounts of 1812 record that women who cleaned the Inverness Town Hall were given clay pipes. In 1604 King James VI of Scotland (I of England) criticised the act of smoking tobacco in his essay ‘A Counterblaste to Tobacco’ in which he described pipe smoking as "a custom loathsome to the eye, hateful to the nose, harmful to the brain, dangerous to the lungs, and in the black stinking fume thereof nearest resembling the horrible stygian smoke of the pit that is bottomless". Clay pipes were also used as childrens toys for blowing bubbles and were manufactured for this purpose into the mid-1900s. The manufacture and use of clay pipes declined throughout the 1900s, the last maker in Scotland was William Christie of Leith in 1962. A clay pipe factory, was built in Glasgow for William White & Son's in 1876-79, designed by architect Matthew Forsyth. The three remaining buildings are sited in the Gallowgate area. The buildings have some of the most intricate and ornate brickwork to be found anywhere in the city, which was inspired by Italian renaissance architecture. The 12th-14th century spindle whorl from near Loch Quien. Diameter 27mm, hole diameter 10mm, Height 14mm. Weight 14g. 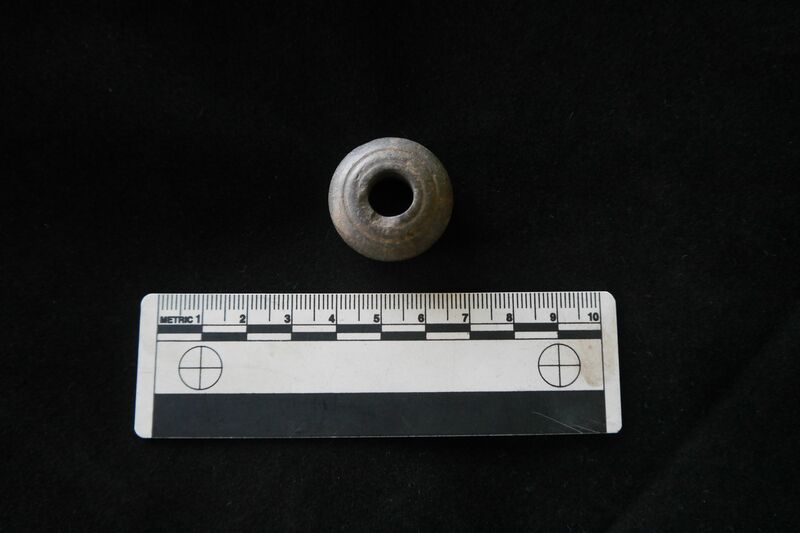 The next artefact is from the medieval period and is a spindle whorl. The object was found during an excavation near Loch Quien and is a lathe-turned piece of stone, decorated with concentric grooves. The stone type is possibly local to the north of Bute, or it could be a glacial pebble originating from the Highlands. The stone is dark grey and fine-grained. These lathe-turned spindle whorls are common in medieval assemblages and have been found at other Scottish sites such as Perth. 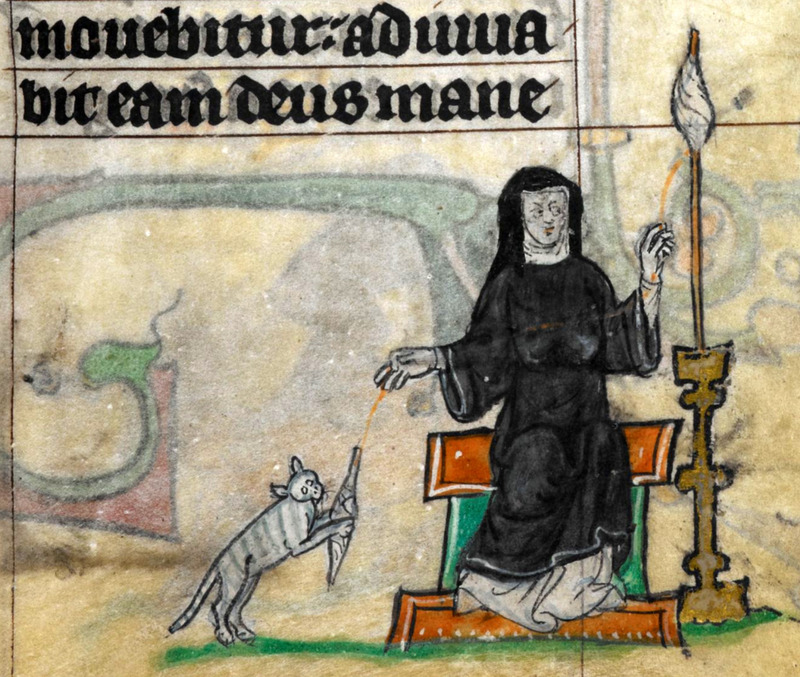 Cats were also a nuisance during the medieval period. Spindle whorls were hung at the end of wooden shafts to provide weight and momentum while spinning wool into yarn. They occur in a range of shapes and materials with ornamentation ranging from plain to highly decorative. Spindle whorls are frequently the only evidence of spinning that is preserved. Spindle whorls indicate female activity at sites, as evidence suggests that only women used these tools in the medieval period. Many spindle whorls are found in fields as they were occasionally lost while being carried to and from other activities. Here is a short film demonstrating the use of a drop spindle. A slightly earlier date for the spindle whorl cannot be entirely ruled out as these have been found in Viking York and are known as York Form C. Another example of a spindle whorl with concentric decoration was found in an early Norse context at Pool, Sanday. Typical Viking Age decorations on spindle whorls included concentric bands. The early Bronze Age Beaker pot from Scalpsie. A Beaker pot from Scalpsie Barrow brings us to the Early Bronze Age around 2300BC. It is decorated with incised linear bands, cross-hatched decoration, vertical lines and chevrons. The remains of the pot are formed of six fragments. The artefact was found in a possible stone setting which is thought to be a primary burial within the barrow. A later insertion of a cist seems to have disturbed the pot. The Beaker pot demonstrates that the use of this type of decorated pottery and burial practice were present on Bute as well as the mainland. Beaker pot fragments, Scalpsie barrow excavation. This Beaker pot was found in Germany but is clearly comparable to the example from Scalpsie Barrow, demonstrating the wide distribution of this style of vessel. The Bell-Beaker culture is recorded across Europe from the late Neolithic period to the early Bronze Age 2500-1800BC. Prehistorians often shorten the name to ‘Beaker culture’, ‘Beaker people’, or ‘Beaker folk’. The Beaker trend is defined by a specific style of bell shaped pottery and its frequent addition to burials. An artist's representation of a Beaker burial. Bodies were typically crouched into a foetal position. The sides of the cist could be stone or wood and sometimes just an earthen pit. 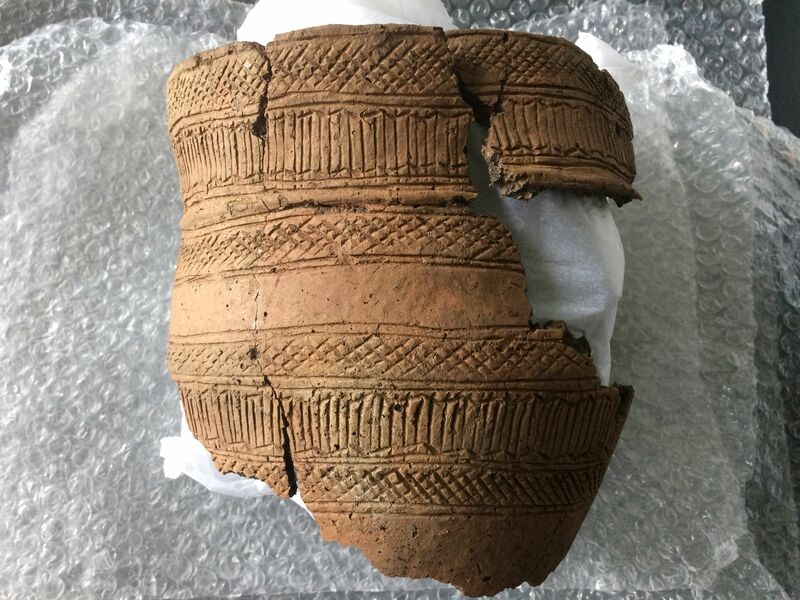 Since the 19th century it has been debated whether the appearance in Britain of Beaker pots in burials marked the arrival of continental migrants, or represented a desirable Beaker-style ‘package’ taken up by different settled groups. Isotope results from a skeleton in a Beaker burial found near Stonehenge, known as the Amesbury Archer indicate a European origin. Recent ancient genome studies have rekindled the debate on the early European migration patterns of Late Neolithic and Early Bronze Age peoples. Ancient-genome study finds Bronze Age ‘Beaker culture’ invaded Britain. A pitchstone blade from Scalpsie Barrow. 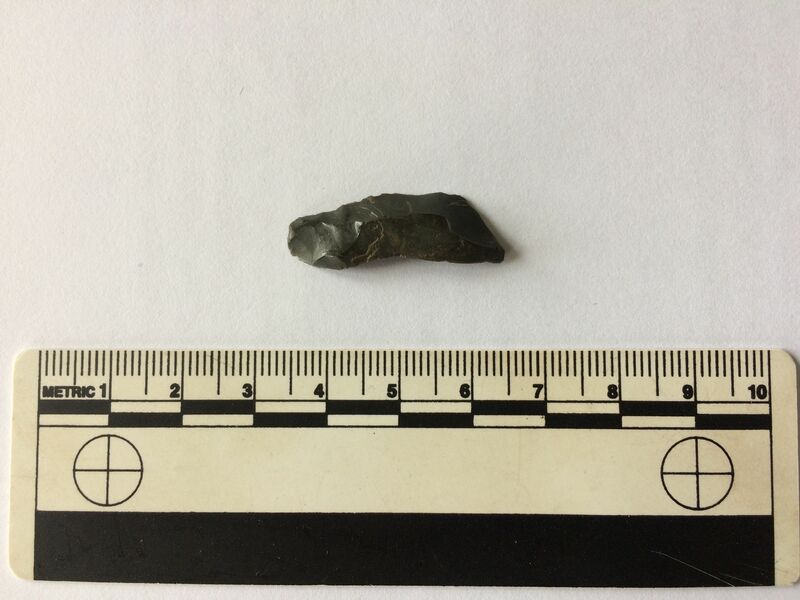 The final artefact is a pitchstone blade also recovered from Scalpsie and possibly dates back to the Neolithic period. Pitchstone is a volcanic glass similar to obsidian, it knaps like flint to produce a variety of fine sharp edges suitable for cutting and scraping. The pitchstone blade from Scalpsie is approximately 30mm in length and 8mm at its widest part. It is opaque and dark grey in colour with a glass-like surface. An outcrop of natural pitchstone at Corriegills, Isle of Arran. 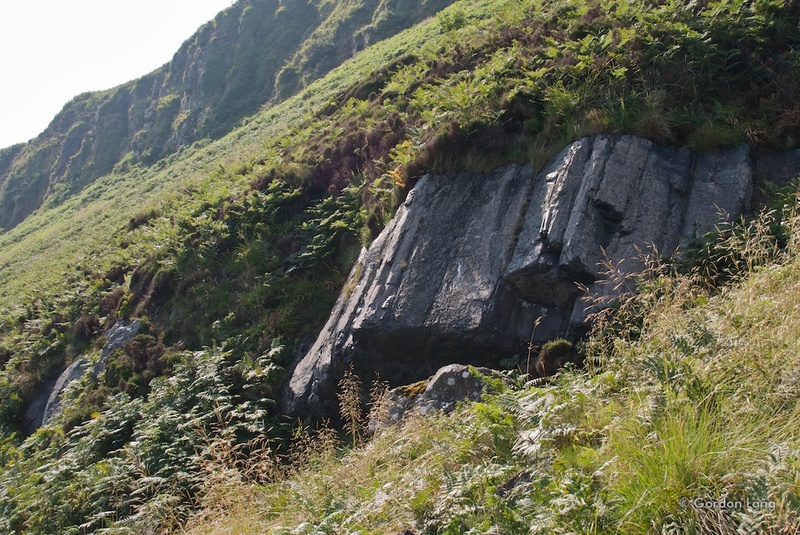 In Scotland, archaeological pitchstone originates from outcrops on the Isle of Arran. While Neolithic and Early Bronze Age examples have been identified on the mainland, it is only on Arran that earlier Mesolithic (middle Stone Age) pitchstone artefacts have been found. This suggests that on Bute and the mainland pitchstone was only exchanged sometime after the Mesolithic period and not before. On the mainland pitchstone assemblages never include Mesolithic types, such as microliths. This is supported by radiocarbon dating of pits containing worked pitchstone. Some archaeologists think that the exchange in pitchstone may be limited to the first half of the Early Neolithic period. Worked pitchstone has been found as far north as Orkney in Scotland and was distributed across northern Britain by means of a wide-ranging exchange network. The presence of the pitchstone blade at Scalpsie suggests that the Isle of Bute must have been a part of that network. Arran pitchstone (‘Scottish obsidian’) – new dating evidence. People during the Mesolithic Period developed specific stone tools to make arrow heads, spears, other tools and weapons. These tools consisted primarily of microliths, small sharp blade fragments, which were often hafted onto wood or bone using pitch or resin. Pitchstone is sometimes referred to as 'Scottish obsidian'.